I thought today would be a great day to share some Led Zeppelin. First up is a piece entitled I Love Led Zeppelin that Cameron did for UK’s The Telegraph back in 2007 to honor the Zeppelin reunion. The article surrounds a 1972 encounter that the band had with The King and is new to the Journalism section. Enjoy! It might also be a good time to point out the Rolling Stone cover story that Cameron did in 1975, along with the small piece on Presence and the mysterious object on the cover of the LP from summer 1976. There’s also the 1973 Circus magazine article that focuses on the band’s non-stop touring. Oh yeah, and don’t forget his liner notes for the Zeppelin box set and his introduction on the Led Zeppelin Portraits book by longtime friend Neal Preston. Whew! 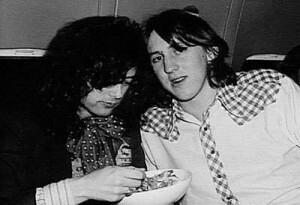 That should keep you busy for awhile getting your fix, but more Zeppelin articles/interviews are coming.